Very impressed with Peru’s second biggest city! With only a million people compared to Lima’s 10 million, Arequipa was a lot more my kind of city and felt more manageable in terms of exploring. I don’t have too much to say, however, as the day spent there was the day following the night bus and so we were taking it easy. Moreover, it was our first experience of higher altitude at 7638ft and I’m sure that contributed to the lethargic feeling I had all day. We did a quick city tour with Fredy, who is actually from Arequipa so was full of tips. He took us to the market where the others sampled empanadas and fresh fruit juice (a shame I missed those but was taking no risks!) and we also saw lots of bunnies and guinea pigs up for sale (probably a happier outlook for the bunnies since guinea pig is a delicacy here!). I bought agua de florida in the witches’ market which is supposedly great for altitude. You sprinkle it on your hands and sniff hard and it clears the sinuses. 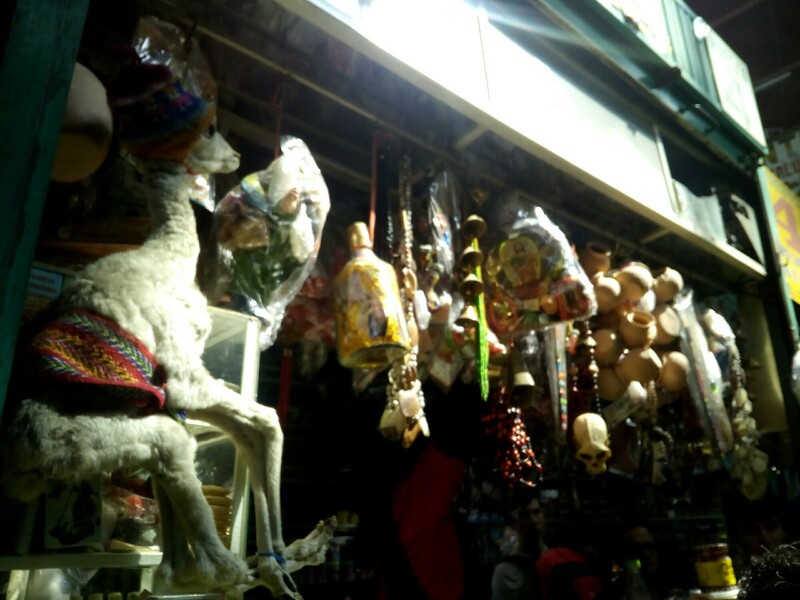 I declined to buy other things on offer such as llama feti dressed in woollen hats, however! We also encountered lots of children dancing and singing in a parade. It seemed slightly less charming when we realised they were quite determinedly celebrating ‘pro-life’ so in other words it was all anti-abortion. Strange to see young kids chanting about something like that but of course it’s a strongly Catholic culture. The tour ended at the famous Santa Catalina Monastery and so a couple of us decided to stay on and visit it while we were there. It was like a town within a town and not at all what I’d expected to see inside a convent. It was well worth paying an extra 5 soles for a guided tour as there was lots of interesting information. The 17th century nuns seemed to have lived in relatively luxurious conditions since the clergy was so rich during that period, and they were mostly Spanish or otherwise European and had 300 indigenous slaves and servants living there looking after only 200 nuns! What amazed me was that there were houses inside the convent. 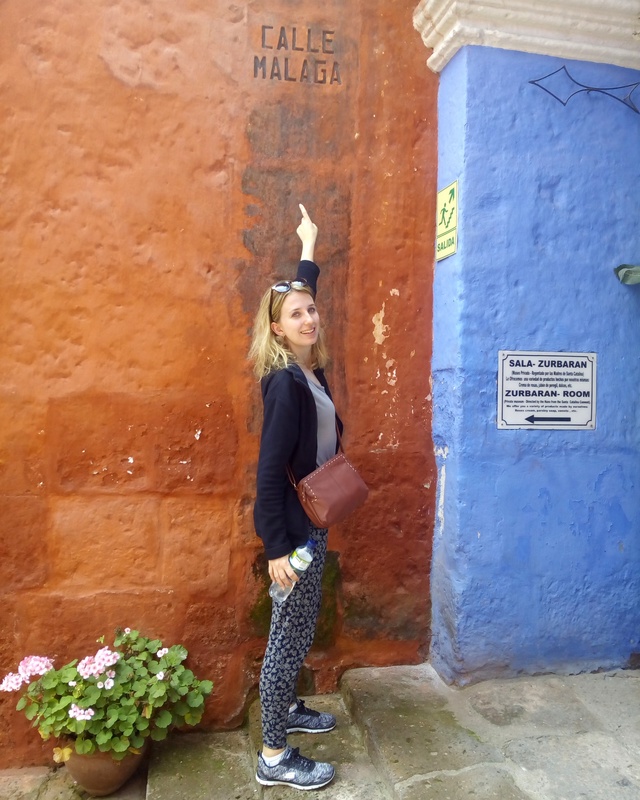 They had little streets named after cities in the Spanish colonisers native Andalusia – it made me smile to see some familiar names from my 6 months in Spain while on the other side of the world! The streets were painted vibrant indigos and terracotta colours and it was like a snapshot of insight into what Arequipa itself would have looked like in the past. Once finished with our tour we just had some lunch with a great view over the central Plaza de Armas. I was on chicken noodle broth/soup for my tummy issue – luckily it seems like you can get that in most restaurants here which is quite nice. Then back, quick nap and out for dinner at a traditional restaurant! Once again I was annoyed not to be able to sample the guinea pig that most people in the group ordered but I had mate de coca (coca leaf tea) and more soup and bread and began to feel better. We went out after and I was very happy when Fredy pointed out a aniseed spirit which Peruvians actually use for soothing tummy bugs! So I was able to have a couple of drinks and enjoy some nightlife for the first time since arriving here, while having some ‘medicine’! The music in the bars here is basically all reggaeton, my guilty favourite, and there were ridiculously cheap happy hours like 2 for 1 mojitos at 15 soles so roughly £1.75 per drink! The next day (which is today) we had an early start to get to Chivay and Colca Canyon, so just a flying visit. But it’s safe to say I enjoyed the 24 hours in Arequipa and I’ll be pleased to look round a little more when we pass through again coming back from the Canyon! Interesting to hear about the food Sarah. I hope they don’t serve cooked turtle any more….I was watching TV last night here in the UK and they showed a British guy in S. America being served a cooked guinea pig. He ate it heartily but it didn’t look appetising….. I didn’t see any turtle but I hope not too! As for the guinea pig, by all accounts it’s quite chewy and fatty but not too offensive in taste…!